The world’s first Active Matrix EPD watch is launched. 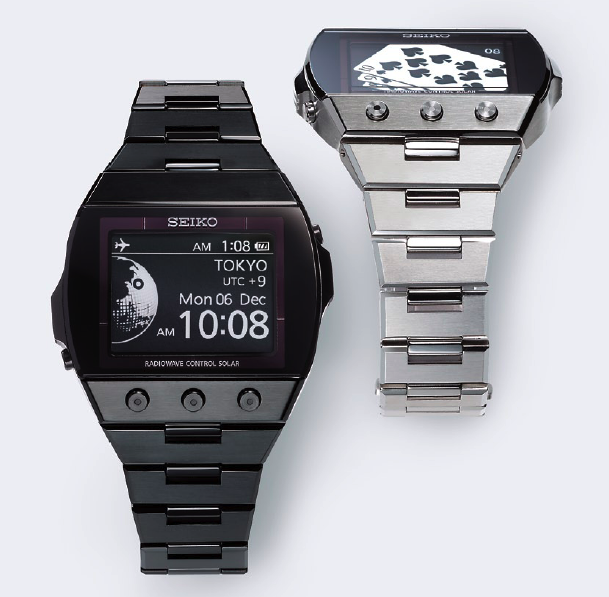 SEIKO WATCH CORPORATION is pleased to confirm the introduction of the world's first EPD* watch with an active matrix system. Three models will be available in selected major markets around the world from December 2010 onward. When the demonstration sample was exhibited at Baselworld 2010, it attracted huge interest from watch enthusiasts, journalists and industry experts alike. With its innovative and very detailed graphics, its clear, high-resolution screen of 300 dpi**, and its wide viewing angle, the new EPD watch demonstrated the future of digital time in a way that impressed the entire industry and opened visitors' eyes to the extraordinary potential of quartz timekeeping allied to innovative displays. In addition to having an entirely new display system, the second generation EPD watch receives a time signal from the world's atomic clocks via radio wave so that the usual 15-seconds-amonth accuracy of the watch is enhanced whenever the watch is in range of the transmitters. The time signal it receives is from atomic clocks that are accurate to 10-13 seconds a day or one second in every 30 million years! It is powered by a self-recharging solar battery, so that no battery replacement is ever required. Once fully charged, thanks to SEIKO's expertise in energy-efficient IC and other hi-tech electronics, the new EPD watch can run for up to nine months even without additional exposure to light. Furthermore, if no button is pressed while the watch remains in darkness for 72 hours, the ‘sleep’ mode is activated. In this mode, the watch remembers the time and continues to receive the radio signal for over three years. As soon as any button is pressed or the solar cells are exposed to light, it awakes and the display operates normally once again. Thanks to its 300 dpi screen resolution and four-shade grey scale, the new EPD watch offers five different styles of time display, all of which are custom-designed by SEIKO and each of which reflects a different and innovative face of digital time. The five display options; just select the one that fits your day, from serious to light-hearted. In the world time mode, the newly designed screen shows time, calendar, the name of a designated city (you can choose from 32 cities!) and the time difference from UTC*** as well as a second local time, its geographical location shown on the globe. The first and second local times can be inverted instantly. The watch can automatically detect and receive the signal of standard time that five stations**** across the globe are transmitting, even the watch is in power-saving mode. The signal can be received manually when necessary. The status as well as result of reception is shown graphically on the screen. The status as well as result of reception is shown graphically on the screen. The status of the watch’s functions is shown graphically on the screen, and the access to its many functions is both intuitive and easy to follow. Just press a single button and each function is displayed and selected, while the convex shape of the watch makes it easy to operate the pushers that are diagonally located on each side. Just press a single button and each function is displayed and selected, while the convex shape of the watch makes it easy to operate the pushers that are diagonally located on each side. EPD stands for Electrophoretic Display, a method of display with electronic ink technology. Electronic ink is a proprietary material that is processed into a film for integration into electronic displays. Although revolutionary in concept, electronic ink is a straightforward fusion of chemistry, physics and electronics to create this new material. The principal components of electronic ink are millions of tiny microcapsules, about the diameter of a human hair. Each microcapsule contains negatively charged white particles and positively charged black particles suspended in a clear fluid. When a negative electric field is applied, the white particles move to the top of the microcapsule where they become visible to the user. This makes the surface appear white at that spot. At the same time, an opposite electric field pulls the black particles to the bottom of the microcapsules where they are hidden. By reversing this process, the black particles appear at the top of the capsule, which now makes the surface appear dark at that spot."